Hooray! The Ramen Burger is within reach – What do I eat now? So of course, I biked to my corner of culinary utopia with my partner in food adventures, strolled through the pearly gates (am I taking this metaphor too far?) and gaped at the tantalizing treasures. And tasted. And photographed. And grinned with sauce glistening from my lips. Even though we live in Brooklyn, it takes about an hour to get to Williamsburg, and 40 minutes to get to Brooklyn Bridge Park. I love good food as much as the next New Yorker, but ugh. Especially when I know the food fest is there every weekend, so it’s not really a limited commodity. Now, the Sunday Smorgasburg relocated to Breeze Hill in the southeast-central part of Prospect Park, near Lakeside. I go for runs around Prospect Park all the time from my apartment. Biking to Breeze Hill? That’s about 15 minutes. How convenient. 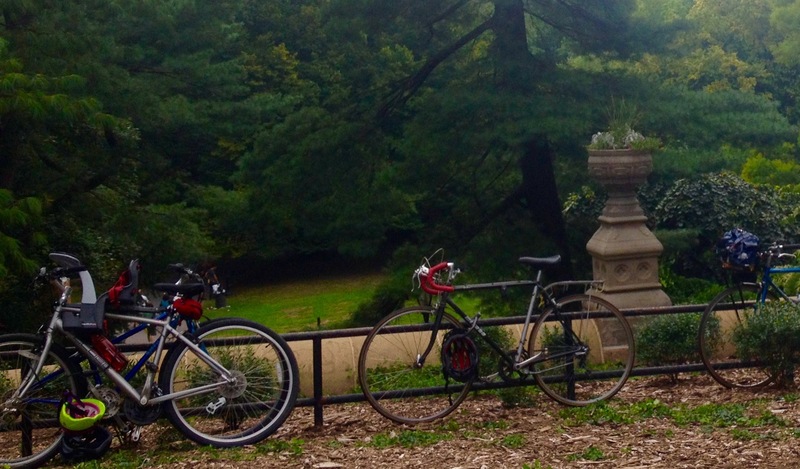 Brooklyn’s Prospect Park is beautiful by foot or bike. Photo by Amy Sowder. A couple years ago, I wandered and tasted a bit of Smorgasburg’s offerings while visiting NYC, and the memory still warms my heart and belly. Now as a NYC resident, I couldn’t wait to be teased by Gooey Butter Cakes, po’ boys, Good Batch’s Nutella ice cream sandwiches, mofongo, Korean tacos, Mighty Quinn’s pulled pork sandwiches, Bolivian ginger-pepper-pineapple drinks and pupusas. As you see, I am not a jaded New Yorker yet. Although my food snobbishness has definitely snowballed, I still get excited and impressed. I already formulated an eating plan before arriving at this meal mecca today. I’m one of those people who like to scan the menu online before meeting friends at a restaurant. Otherwise, I’ll be so pleasantly lost in delicious options, it could take me 30 minutes to order. The goal: Eat the Ramen Burger. 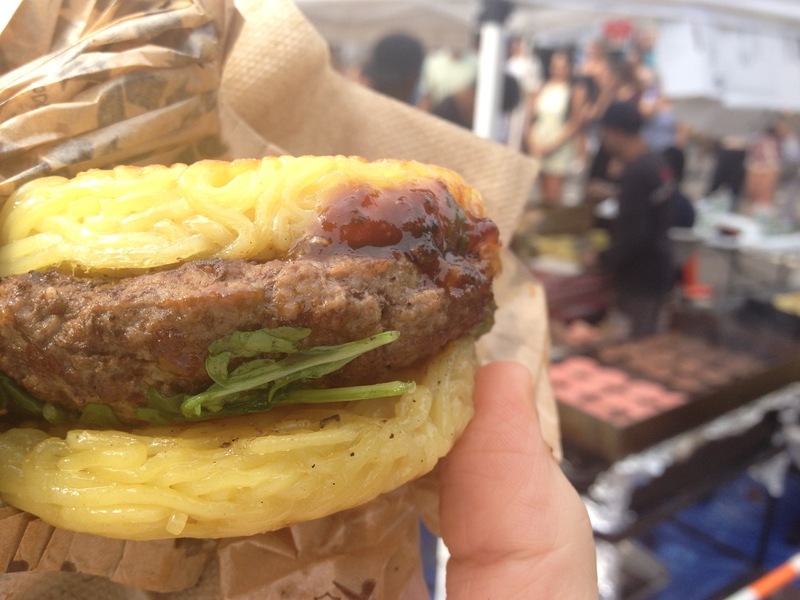 The much-hyped Ramen Burger, available at Smorgasburg for $9. Photo by Amy Sowder. This hamburger with ramen noodles shaped into bread-like buns is probably the biggest food fad, valid or not, at Smorgasburg. The line must’ve been 25-people long, but it moved fast. This booth’s team was efficient, with two grills going, one with more than 24 ramen cakes, and the other, more than two dozen USDA prime ground beef chuck patties. I sent David off to get his fill at other booths while I waited in line, foolishly believing the line would take forever and he’d return with his change before I reached the front of the line and had to pay. The Ramen Burger is $9, and I had $6 left in my wallet after David wandered off with a $20 bill. The line moved too fast. I kept anxiously scanning the crowd for his bobbing head, frantically sending him five text messages about how close I was getting to the front without enough cash to pay for the burger. I even called twice. I reached the front, and the young woman in a baseball cap looked up at me and smiled. I was forced to shake my head in disappointment and step away, with a barely muffled f*4#!!!! I shuffled in defeat to the back of the line again. Then David returned. I survived. I thrived, really, while tasting the delicious gourmet gimmick I’d heard about for more than a couple years. Is this burger-noodle hybrid still a fad if it’s lasted that long? The Ramen Burger was voted one of the 17 most influential burgers of all time by Time Magazine. Yet a couple friends announced the Ramen Burger isn’t all that. I heard someone at the food market say it was “OK.” So my expectations were lowered to realistic levels. Yes, the Ramen Burger was good. It was also an interesting twist. Unless it’s a potato roll, I’m usually not too interested in burger buns anyway. Often I’ll remove half of the bun to save those empty carbs for what I really care about: ice cream. Right?! But the gelled-together ramen “buns” added a great texture to the beef patty, topped with arugula, scallions and a shoyu glaze, a sweet-soy sauce. I was satiated and pleased as we wandered the grassy area where everyone gorged and lolled about the grass under the trees in the summertime sun. Would I get the Ramen Burger again? Probably not. There are at least 100 other tempting options at Smorgasburg. And I only have until October 11 before this opportunity ends. I did try a few more dishes on this go ’round. I moaned at my two bites of David’s salteña, a Bolivian-style empanada with chicken, hardboiled egg and a sweet-savory sauce at the Bolivian Llama Party food stand. The Party also makes that bright, quenching ginger-pineapple-pepper juice. Do that. And dessert. Remember that thing? I never forget. I tried to keep it a tad light, veering away from the tempting Gooey Butter Cakes and other delights. 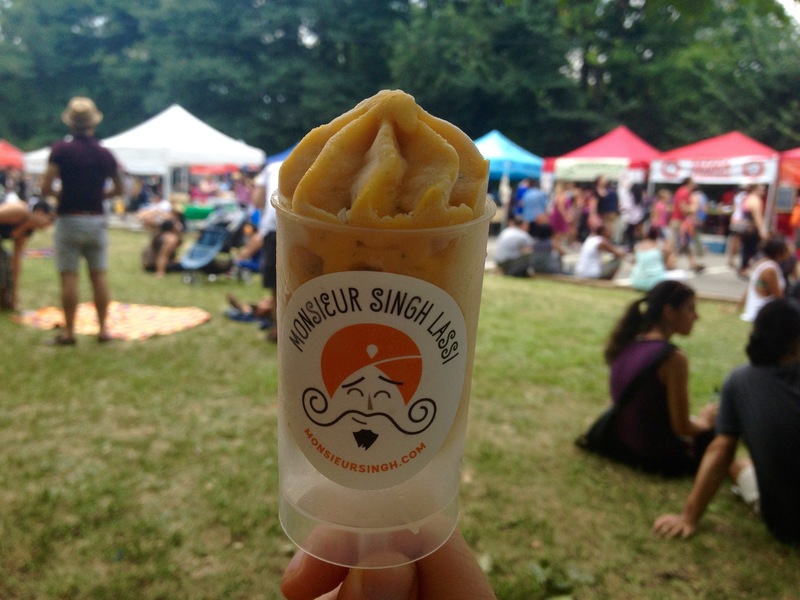 I savored the mango lassi pop from the Monsieur Singh Lassi cart. A little girl in front of me sampled the lemon-honey lassi pop and when her mother asked for her opinion, she looked up from her licked-clean wooden tasting spoon and declared with unbridled joy, “I love this!” A ringing endorsement. 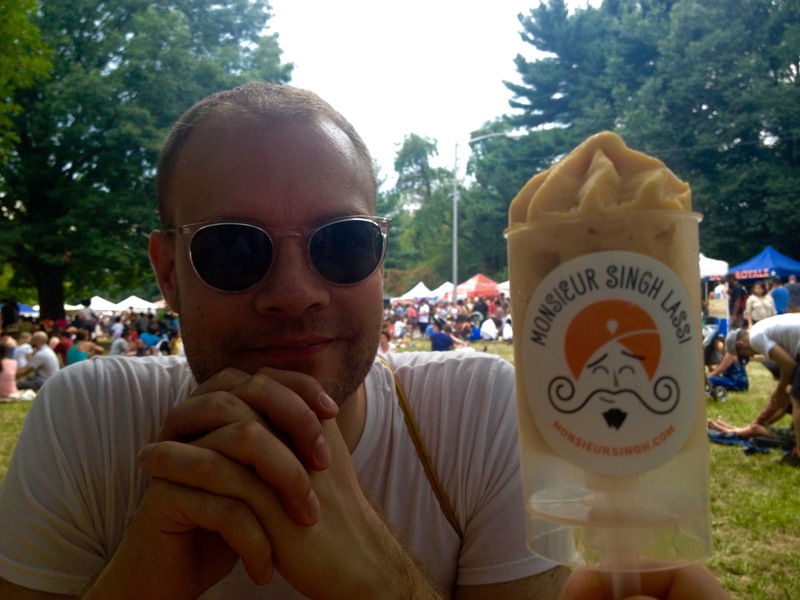 Monsieur Singh Lassi makes a great mango lassi pop. Photo by Amy Sowder. David, my partner in eating and other adventures, and my mango lassi pop. Photo by Amy Sowder. I want all the things. Alas, my budget and health (remember that?) promote moderation. So I vow to return. And go for a run now. Amy Sowder NYC-based food, fitness, and culture writer — and cat lover extraordinaire. Social media addict. Ravenous consumer of novels. Greedy for exercise endorphins and healthy versions of decadent dishes.